This describes liver inflammation caused by consuming alcohol and is most likely to occur in people who drink heavily over many years. 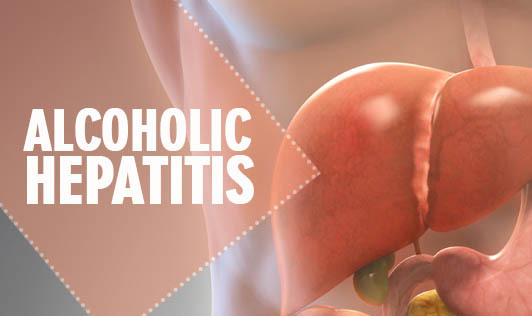 The relationship between drinking and alcoholic hepatitis is complex. It is important to note that alcoholic hepatitis doesn't necessarily occur only in heavy drinkers, but can also occur in people who drink moderately as well. The process of breaking down ethanol, the alcohol in wine, beer and other liquor, produces highly toxic chemicals such as acetaldehyde. These chemicals trigger inflammation that destroys the liver cells which overtime, appear as web like scars and small knots of tissue that replace healthy liver tissue, thus interfering with the liver's ability to function. Irreversible scarring called cirrhosis, is the final stage of alcoholic liver disease. Alcoholic Hepatitis is a very serious disease. See your doctor if you have any signs or symptoms of alcoholic hepatitis or any other symptoms that worry you!